This Is Protecting The Shield? 1. I think the more I read about Deflategate, the less faith I have in the NFL. I’m not saying Tom Brady and the Patriots are totally innocent, but no sensible person would describe the league’s proof as being anything close to “beyond a reasonable doubt.” And just because the CBA doesn’t say it has to be doesn’t mean it shouldn’t be. I’m not big on calling for someone’s firing, but Roger Goodell went after the sport’s grandest star (maybe ever) and this decade’s most accomplished franchise. In doing so, he created a gargantuan distraction for both during Super Bowl week. Then he allowed the misinformation from that distraction to percolate for many months, damaging the brand of all parties involved (including, indirectly, the league’s). This is the antithesis of “protecting The Shield.” Barring a turn of events in this Deflategate saga—and with the way things have gone, there very well could be another turn of events—Goodell should lose his job. 2. I think I wish every team was as transparent as the Dallas Cowboys. “Anything goes with them,” one PR staffer told me this summer in regards to the club’s media coverage policies. This week the Cowboys themselves disseminated what most teams would deem unflattering media coverage—but what all fans deep down really love—by posting video of a good training camp fight. Amazingly, it involved one of their biggest stars, Dez Bryant, who, fair or unfair (it’s mostly unfair), already has a reputation for hotheadedness. Bryant’s fight with cornerback Tyler Patmon was posted on the team’s own website, and the video included post-fight interviews with both players. Hear, hear! to a team not taking itself too seriously. 4. I think the Lions were smart to re-sign DeAndre Levy. No linebacker stood out on film as regularly as he did last season. And Levy was refreshingly level-headed about the whole thing, saying a new contract was never a huge priority (O.K., maybe that’s just political correctness talking) and that once the figures of the deal are out, Tampa Bay’s Lavonte David will probably earn a richer deal. Here’s a man who understands how the NFL market works. 5. Speaking of NFL markets, I think Russell Wilson’s contract fascinated me. I expected a longer, uglier, pricier fight between the Seahawks and their star quarterback. But Wilson smartly realized that by playing out his rookie deal at $1.5 million, he’d essentially be losing a year from his high-earning-power window. And Wilson likely added another year to that window by agreeing to a four-year deal, which means he’ll be 30 when this deal expires. That’s the much smarter way to bet on himself. Quarterback contracts are overanalyzed and always get surpassed by another quarterback’s new deal anyway. Because of the limitability of quarterbacks, no position is more driven by sheer market price. That’s how guys like Tony Romo, Matt Ryan and Joe Flacco have all taken a (brief) turn as the highest paid at their position. • INSIDE THE WILSON DEAL: Andrew Brandt breaks down the pros and cons for both sides. 6. 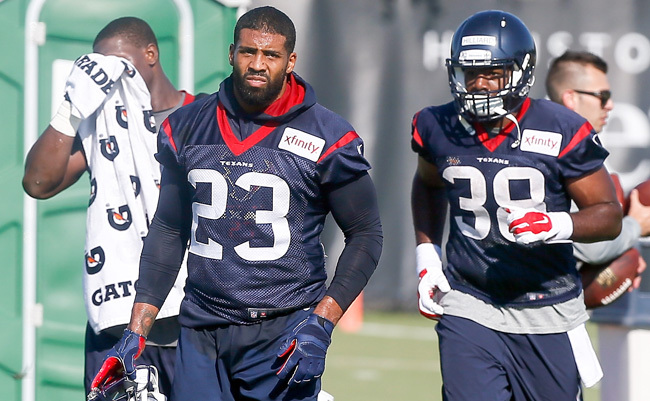 I think Arian Foster’s groin injury means the Texans are done as playoff contenders. Foster, when healthy, is a top-five running back who understands the nuances of Houston’s staple zone game. He can create his own yardage, both as a runner and short-area receiver. Houston might find another plug-and-play zone running back, but not one good enough to offset an iffy quarterback situation. 7. I think what Dan Quinn told Robert Klemko about Desmond Trufant—that the third-year corner will essentially play the Richard Sherman role in Quinn’s new scheme for the Falcons—is fascinating. Trufant is 6-feet, 190 pounds. He’s already a top-15 corner whose game is predicated on short-area quickness, not physicality. Sherman is 6-3, 195. Those extra three inches matter when it comes to jamming wide receivers. But Sherman’s excellence is in his technique as much as anything. That’s where Quinn thinks Trufant can improve. We’ll see. 8. I think every team ought to treat its training camp fans like the Raiders treat theirs. For starters, there are no fees for entrance or for parking at the team’s Napa Valley complex. And free, ice-cold bottled water and Gatorade are available for everyone at all times. Photographs are allowed, though only during certain sessions. Those rules get observed because the security staff is so respectful in the way it enforces them. Autograph sessions follow every practice. Your training camp fans are your most ardent supporters. Most of them know all 53 players from last year’s roster and yell encouragements even to the undrafted rookie free agents who are living on the bubble. The Raiders understand and appreciate their fans. And thankfully, they’re not the only organization like this. It’s worth it for a team to go out of its way to give training camp fans the best experience possible. 9. I think the NFL should consider staggering its Sunday early afternoon start times the same way it staggers the late afternoon start times. With the increased popularity of The Red Zone channel, this would only get more eyeballs on more fourth-quarter plays in close games. 10. I think the Aaron Kromer situation is a little puzzling. The Bills suspended the offensive line coach six games after chargers of him assaulting a minor were dropped. Kromer and the family of the teenager he allegedly struck reached an “amicable resolution.” I have no inside knowledge of what went on, and I do not know Kromer very well. But I have met with him before, exchanged e-mails and been around him in social environments a few times. He has always treated me with the utmost kindness and respect. He’s one of the last NFL coaches I would have guessed would ever be entangled in this sort of situation. I’m not saying my limited interactions with Kromer have any bearing on his guilt or innocence in this now-completed legal affair. But I feel that sharing my experience with the man was a fair thing to do here.